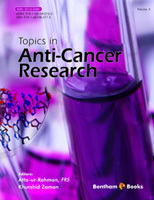 This is the fourth volume of the Series entitled Topics in Anti-Cancer Research that constitutes updated reviews on important topics relevant to recent cancer studies based on articles published in the journal Recent Patents on Anti-Cancer Drug Discovery. The topics included in the present volume will be of great value to clinicians, scientists and R&D experts aiming to access the latest developments in the field of cancer treatments. There is increasing interest in antibody-delivered drugs and toxins in cancer therapeutics. This is because they selectively direct highly potent cytotoxic agents to cancer cells that present tumor-associated surface markers. This results in a reduction in systemic toxicity. In the first Chapter Dosio et al. present immunotoxins and antibody-drug and antibody-toxin conjugates as potential anti-cancer agents. Enhanced expression of the multi-functional protein nucleolin (NCL) ihas been observed on the surface of activated lymphocytes, angiogenic endothelial and several different types of cancer cells. Papadimitriou et al.discuss how the cell surface nucleolin can act as a target for cancer therapy, thereby providing a research approach targeting NCL cancer therapy. Tubulin is a useful and strategic molecular target for developing new anticancer drugs since the process of microtubule assembly and disassembly can be blocked by agents that bind to the β-tubulin subunit. Nepali and Ohja, in Chapter 3, have presented the latest developments in the field of tubulin (polymerization) inhibitors, modified analogs and derivatives involved in the anti-tubulin drug discovery. Resveratrol is a natural polyphenol found in red grapes and other natural sources that has attracted much interest because of its many beneficial effects as an antioxidant, anti-inflammatory, and antiatherogenic agent, as a platelet aggregation inhibitor, as well as as an antiproliferative and proapoptotic factor in various types of cancers. Mihăilă discusses the chemosensitizing role of resveratrol as a potential drug on leukemic cells, the low bioavailability and new extraction methods and new formulas for optimizing resveratrol effects in the light of patent studies on adjuvant agents for the cure of oncohematological disorders in Chapter 4. Cytokines and chemokines play an important role in cancer-related inflammation. In view of the multiple functions of cytokines and chemokines in tumorigenesis, There is considerable research directed at the elucidation of these roles in order to get a better understanding of the pathological processes of cancer development that can lead to innovative anti-cancer strategies. Amedei and Prisco, in Chapter 5, have reviewed the role of cytokines and chemokines pathways in cancer immunotherapy for different cancer types. The fusion of two or more sub-structures that serve as pharmacophoric sub-units can lead to the development of more powerful anti-cancer hybrid drugs, a process known as molecular hybridization (MH). Chapter 6 by Nepali and Mehndiratta focuses on the use of this approach for the design of anticancer hybrids. The structures of the hybrid drugs and their mechanisms of action in various cell lines are reviewed. Gold rods, when irradiated with ultrasound, result in bio heat transfer to tissue, which can be a potential alternative to kill cancer cells. Several methods for cancer treatment with hyperthermia are currently available. These approaches are discussed in Chapter 7 by Ioannis et al.. There is an inverse correlation between estrogen-levels and breast cancer risk in obese women. The underlying causes of this inverse correlation should lead to a better understanding of breast cancer etiology and promote primary prevention measures Suba in Chapter 8 summarizes the various methods reported for the prevention and therapy of obesity -related disorders and the associated breast cancer due to insufficient estrogen levels or loss and increased tendency of insulin resistance. Talevi et al., in Chapter 9, present the recent applications of polymeric - based nanosystems as nanodelivry vectors for the treament of differenrt cancers. The study emphasizes the patents on polymer based organic nanocapsules, nanospheres, dendrimers and nanomicelles and their role in polymeric nano delivery systems due to their physiochemical and biochemical characteristics. In Chapter 10, lipid based patented Nano system applications for anticancer drug delivery is discussed by Alan & Ruiz. These lipid based formulations affect the pharmacokinetics and pharmacodynamics properties of the drugs used in the treatment of cancer. Santibanez et al., in Chapter 11, review the interaction between the transforming growth factor beta1 (TGF- β1) and urokinase type plasminogen activator (uPA) system in tumorigenesis. The pathways of regulation of uPA expression by TGF- β in tumor, and conversion of plasminogen to plasmin which may release TGF- β1in cancer cells, are supported by current cancer treatments and patents on TGF- β.
Cheepsattayakorn, in Chapter 12,describe the functions and mechanisms of action of novel compounds and analogs discussed in recent patents for the treatment of non small cell lung cancer and small lung cancer chemotherapy. Rinaldi et al. provide recent coverage of DNA vaccines against cancer involving enhancement of immunogenicity by the application of different approaches. The use of immune modulators derived from tetanus and vegetable toxins and other immune molecules is reviewed in Chapter 13. We hope that the present fourth volume will attract audience from cancer field, including oncologists, R&D scientists, as well as researchers in pharmacology and medicinal chemistry, looking for safe new methods and drugs for the inhibition & cure of cancer and for the clinical trials of new anti-cancer drugs. The editors are grateful to the authors for their excellent and timely contributions. We also wish to thank Mr. Mahmood Alam, and Mrs. Rafia Rehan. As well as other members of Bentham Science Publishers for their active involvement and support in the completion of the eBook. National University of La Plata (UNLP) - Argentinean National Council for Scientific and Technical Research (CONICET) CCT La Plata.